Please make sure all items are clearly labeled with your child’s name. Separation anxiety is not unusual – in fact, it’s quite common. With a few tried and tested strategies, ewe can help overcome separation anxiety and make drop off time easier for everyone. Separation anxiety tends to be caused by two things: a change in surroundings, such as moving house, changing schools/care providers; the appearance of parental separation anxiety. Help your children and yourself feel less anxious at drop off-time and keep separation anxiety under control. A good orientation process can be really effective at reducing the onset of separation anxiety. Whether it’s a new room, new educators or a new centre, guide children to prepare for the impending change in advance. It’s not just children who love routines – adults benefit from them too! Try to create a regular, reliable routine for childcare/kinder days, to help everyone understand what to expect. On arrival, knowing what will be happening in the centre will assist children to be even more confident and settle into the day better. (This will help you relax too!) At the door, we have some lines for parents to say to their child and the educator on leaving. 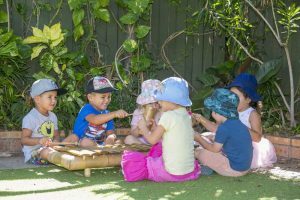 We believe that collaboration with families is essential for the best outcomes for children in early childhood. We will take a photo of the hug/cuddle on departure to go up on the wall near the gate. Children love to be added to the gallery as they can see that this is not just happening to them alone.